With the iPod consistently taking the top spot among consumers for personal mp3 players, it’s little surprise that the program that allows users to load music, video, contacts, pictures, applications and more onto your iPod or iPhone has become the ubiquitous choice for music management. We’re of course talking about Apple’s iTunes. While iTunes does a fairly good job of keeping track of your music, allowing you to sort it by genre, title, artist, album, etc. then arrange the music into playlists; the software is not immune to human input and the occasional missing file. While iTunes does a fairly good job of keeping track of your music, allowing you to sort it by genre, title, artist, album, etc. then arrange the music into playlists; the software is not immune to human input and the occasional missing file. If you can’t find a specific piece of music in iTunes, there are a few things you can try in iTunes and Windows to recover music. If those efforts fail, turn to data recovery software like ParetoLogic’s Data Recovery Pro to aid in your search for missing music and restore iTunes. Essentially, you want to be as general as possible with your search criteria. It’s easier to work through a list of possible matches, than to have no results due to specific search criteria. By searching a broad area, and with generic terms, the odds of finding lost iTunes music are greatly improved. If using the search in iTunes or Windows has failed to locate your file, you should consider using data recovery software such as ParetoLogic’s Data Recovery Pro to recover iTunes music. The program is a data recovery suite that can be used to find missing files, including deleted music. The software can also find missing or corrupted files in the iPod itself. Data Recovery Pro works because when you “delete” a file; the information isn’t physically removed from the hard drive. What happens is that the space where that file was located gets marked as being available for use. Until new information is written to that location, the old data is still there. Whenever you perform a task on your computer, data is written to the hard drive. Because the lost file you are trying to recover could be overwritten each time you use the computer, it is extremely important to stop using the computer immediately! Leave the computer on and download data recovery software like Data Recovery Pro. Once installed, the program can quickly locate and restore deleted iTunes music, providing it hasn’t been overwritten with new data. If you can’t find a specific song on your iPod or in iTunes, try performing the searches outlined above. 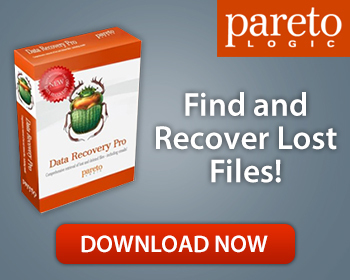 If those fail, turn to ParetoLogic’s Data Recovery Pro to locate and recover your lost or deleted iTunes music.